Iran has warned the US not to cross the red line on Syria threatening it would have severe consequences for the White House. This follows a statement from Syrian officials who said a strike would create very serious fallout for the whole region. "America knows the limitation of the red line of the Syrian front and any crossing of Syria's red line will have severe consequences for the White House," the Iranian Fars news agency quoted deputy chief of staff of Iran's armed forces, Massoud Jazayeri, as saying. Syrian authorities also warned the United States against any military intervention, saying this would"inflame the Middle East". "US military intervention will create very serious fallout and a ball of fire that will inflame the Middle East,"Information Minister Omran Zoabi told the Syrian state news agency, SANA. The warning comes as Western officials stated they are considering a serious response from the international community to the alleged use of chemical weapons in the Arab state. On Saturday, British PM David Camerons spokesperson said that both the UK and the US have tasked officials to examine all the options. At the same time, US Secretary of Defense Chuck Hagel said that the Defense Department is prepared to exercise whatever option - if he [Obama] decides to employ one of those options". Earlier on Friday Hagel suggested the Pentagon might move naval forces closer to Syria in case Obama decides to proceed. 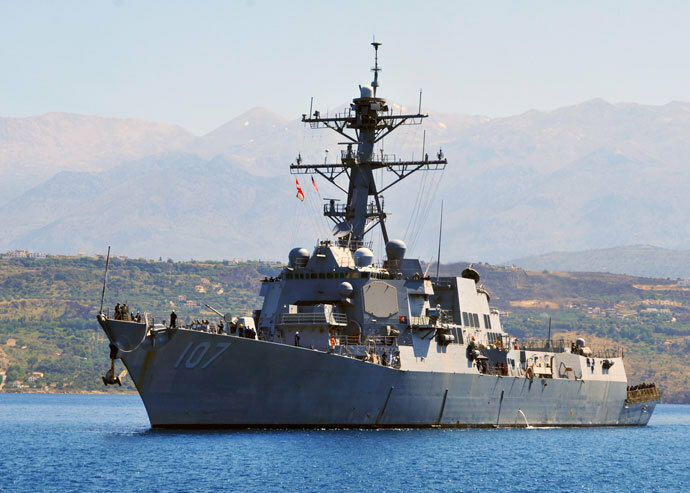 However, US media reports that four US Navy Destroyers  USS Ramage, USS Gravely, USS Barry and USS Mahan  are being pre-positioned in the eastern Mediterranean Sea, although officials stress that the US Navy has received no orders to prepare for military action. All four warships are said to have been equipped with cruise missiles. It was initially planned that the USS Mahan would be replaced with the recently arrived USS Ramage, but navy commanders decided to change the agenda and now have four warships in the region instead of three. Also, reports say that among the military options under consideration are missile strikes on Syrian units believed to be responsible for chemical attacks, or on Assad's air force and ballistic missile sites. Syrian rebels fighting to oust President Bashar Assad have accused government forces of attacking people in the Damascus suburbs with toxic gas on Wednesday, claiming it killed anywhere between dozens to 1,300. Official Damascus has dismissed the accusations and in response blames rebel forces for the alleged attack. Earlier Syrian government said that in light of the event it was ready to engage in maximumcooperation with UN experts, according to Russias foreign ministry. Following the August 21 attack reports, Russias Foreign Ministry issued a statement suggesting the alleged attack was a provocation on behalf of the rebel forces. A homemade rocket with a poisonous substance that has not been identified yet  one similar to the rocket used by terrorists on March 19 in Khan al-Assal - was fired early on August 21 [at Damascus suburbs] from a position occupied by the insurgents, the Ministry then said in a statement. Western powers, however, suspect Assads forces and demand that the UN team be allowed to examine the scene of the recent attack in a Damascus suburb. The UN team arrived in Syria on Sunday to inspect three sites under an agreement reached with Syrian authorities. French President Francois Hollande stated on Sunday there was "a body of evidence indicating that the August 21 attack was chemical in nature and that everything led to the belief that the Syrian regime was responsible for this unspeakable act". The White House official, who spoke on Sunday on condition of anonymity, said that the White House believes the Syrian government is barring a UN investigative team immediate site access to give the evidence time to degrade, according to AP. Iran claims that the Syrian government had told Tehran it would allow UN inspectors to visit the site of the reported attack. However, a report on state-owned SANA suggested UN inspectors would not be allowed to visit the site of the recent reported attack because it was not part of a previously agreed list of locations. Damascus would cooperate "significantly and transparently" with UN investigations but not allow any"inspection that will prejudice national sovereignty", SANA quoted Information Minister Omran Zoabi as saying. At the same time the still volatile situation in Syria is set to deteriorate even further with opposition forces claiming to have received military aid from Turkey. Also Al-Qaedas affiliated bloc Al Nusra, involved in anti-government fighting, pledged in a YouTube video to target Alawite villages and towns in response to the alleged chemical attack.